Can you believe there is actually a color family I am lacking in my polish stash? There is, and I didn't notice it until recently when I was craving one of these shades. The color my stash is lacking, is berry (purply pink colors) shades. I really have very few, and the few I had at one point were not great, so of course I changed that! 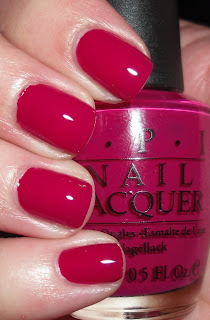 This OPI satisfies my berry shade needs! Miami Beet is a medium beet/purply pink (I clearly cannot describe this color) creme. This is a great color! It is very flattering. I just see this as a nice spin on the classic red. There is something about this color that just reads classy. This color will not go out of style. What a great berry shade! i really dont think this color could be anymore perfect. Definitely adding it to my ever-growing wish list! This polish is one of my favorites. I was wearing it when I got engaged, and every time I look at the pictures, I have to admit my eyes go straight to my nails. Oh, yes, it is classy! I love it! How many coats are you wearing the picture? This would be my ideal pedicure shade! I will definitely seek it out now! I used to have a lot of this range of hues in my stash...I think it was because I really went right to anything that smacked of red first in making my choices reaching back to the 80's and 90's to the point I had and still do more reds range shades than anything....but now days have a huge amount of plummy pink red - BTW - great name for this hue. I have this shade and it's still sitting in my untrieds - it's been out for years and I still have not tried it!!! Ya think I have too many polishes maybe that I cannot get around to them all???? Looks great on you! I don't have a lot in this family either. This color looks great on you.